Home > Activities > BlastOff! Connect four 24“ tubes to create a base. Slide two curtains onto two 24“ tubes. Add the top of the triangle created in Step 6 to the top of the rocket. Be sure the equators of the connecting spheres are facing upward. The rocket ship is ready to board! 1. 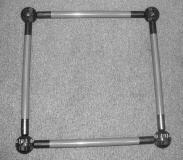 Create another square using four 11” tubes and four connecting spheres. 3. Attach the last Toobeez curtain from the top of the square to the bottom. It will hang around and below the first curtain. This will be the meteor catcher. Attach a sphere to each end of a 16” tube and place it next to the “moon” (therapy ball). This will be the meteor blaster. 1. Create a triangle with the three stations. 4. Place the meteor catcher next to the swing. 5. Place the therapy ball “moon” as the third point in the triangle. 6. Connect the swing and the therapy ball with a piece of rope/Thera-band, creating a trail on the floor between the two stations. 7. Connect the therapy ball and the rocket ship with the third piece of rope/Thera-band from Step #3. 8. Place the bean bags in front of the swing. 9. Place the five balloons in front of the therapy ball. For a student or a child that presents with a lot of flexion in his/her hip and pelvis, trunk, neck and shoulder area, lying prone is a great way to facilitate extension of the child’s body. This is also a great position for children that present with hypotonia/low muscle tone throughout their body. Pushing themselves in this position is a way for the child to control their own vestibular experience, and it is a great way to weight bear on their upper extremities to strengthen hand, arm, shoulder and neck muscles – all important muscles for the complex task of handwriting. 1. Instruct the child to climb into the rocket ship and sit down on the floor to wait for the directions. 2. Read aloud the following Activity Challenge Box to the astronaut. Challenge: Float through outer space by following the path. Once you reach a station, catch or blast as many meteors as you can. 4. The therapist can shake the rocket ship a little as they blast off into space. The child and the therapist can also make blastoff noises as they take off. 5. Once in outer space, the child should follow the rope to their outer space experience (bend down, pick up the rope, and follow it to the swing). 7. Swing the child in linear motion (forward and backward). The child should remain facing forward and facing the therapist. 8. The therapist should then position him/herself in front of the student with the basket of bean. 9. Toss a bean bag or balloon (meteor) one at a time toward the child while he/she is swinging. The child is to catch the “meteors” in the meteor catcher. Make it a game and try to catch three, five or ten – let the astronaut decide! 10. Once the child catches the number of meteors he/she set out to catch, request that the child slow him/herself down until stopped. Have the child climb off the swing and follow the rope leading from the swing to the therapy ball. 11. With the meteor blaster in hand, have the child sit on the moon, making sure that his/her feet are firmly planted on the ground. The child can then begin to bounce on the “moon.” The therapist should reposition him/herself in front of the child once again. 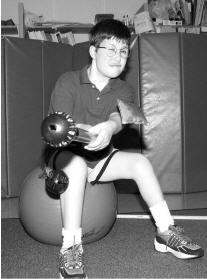 The up and down motion of bouncing on the therapy ball and the linear to and fro movement on the swing both provide a different type of vestibular stimulation to the child’s nervous system called oscillation. 12. Again, ask the child to identify how many meteors he/she is going to blast. Setting goals and achieving them is a great self-esteem booster! 13. The therapist should gently toss the balloon meteors toward the child. The child is to hold on to the meteor blaster with two hands in order to hit or “blast” them with the meteor blaster. Instructing the child to hold on to the meteor blaster with two hands allows both sides of the body to work together. By facilitating crossing midline on both sides, both hemispheres of the brain are speaking to one another, and the child’s brain is preparing to complete complex tasks such as reading, comprehending, handwriting, moving and thinking simultaneously. 14. Once the child reaches his goal of blasting meteors, have the child follow the rope back to the rocket ship for a cool down, countdown. 15. When then child is in the rocket ship, ask the child to sit on the floor and slowly count up from one to ten. When the child is finished counting, give a couple of extra moments for the child to prepare for the transition to his/her next task. Therapist Tip: If a child demonstrates difficulty calming him/herself, try wrapping the child in the weighted blanket to provide calming deep tactile input to the child’s body. 16. When the activity is complete, move on to the Discussion and Processing questions. For children who do not enjoy lying on their stomachs or present with g- or j-tubes, have the student sit upright in the swing to promote active sitting (since the child will be moving while he/she is sitting). Active sitting requires core muscles in the trunk to contract in order to maintain balance while moving. 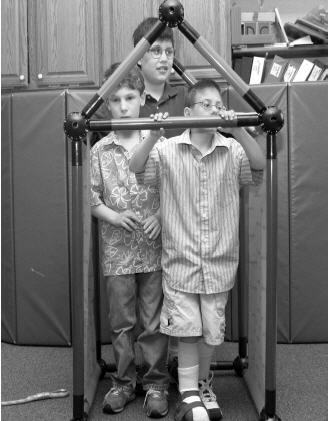 This is also good for children who present with hypotonia/low muscle tone in their trunk. Strong trunk muscles are important because they help with proper posture needed for sitting or walking upright. Good upright posture allows our organs to function properly and ensures that our diaphragms are able to move appropriately so deep breaths can provide adequate oxygen to the brain. As a result, students are calm, organized and ready to learn. Observation of the child’s participation in pretend play that required integration of many senses to produce an adapted response. Does swinging have a calming or alerting effect on the child? Does bouncing have an alerting effect on the child? What made you smile during the activity? What was a hard part of this activity? Do you feel that you are better focused and/or ready to complete a quiet, seated activity after swinging in the swing and bouncing on the ball? 1. Change the direction of the meteors. the bean bags. This trunk rotation is an important component to normal gait patterns when walking. If the child is not able to catch the meteors in the basket or use the Toobeez to blast the meteor balloons, ask the child to catch the bean bags with their hands and to hit the balloon back to you while seated on the swing and seated on the therapy ball. 3. Involving children who use wheelchairs. Create a rocket ship large enough to place the wheelchair on the inside. You will need to use four 36” tubes as the base of the rocket ship. 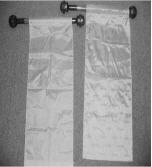 Eliminate the need to roll over a tube with the wheelchair by removing one tube to create an opening so the wheelchair can easily move through. Complete the countdown and then wheel the student to the swing. 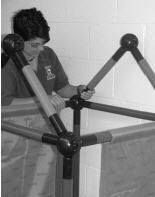 Safely transfer the student into the net swing or Cuddle Swing® (or another swing that the student is comfortable using). Therapist Tip: Please ask another staff member to complete a two- man transfer if the child is unable to bear weight through his/her lower extremities. If the child is lying supine in the net swing, hold the balloon meteor from above (at an appropriate distance corresponding to the child’s active range of motion in his/her upper extremities) and ask the child to reach out to touch or bop the meteor with is/her hands. 4. Involving children who use wheelchairs (outdoors). Build a Toobeez rocket ship large enough to accommodate the wheelchair. This will require more than one Toobeez set, as the frame of the rocket ship will need to be built with all 36″ tubes. Complete the countdown. 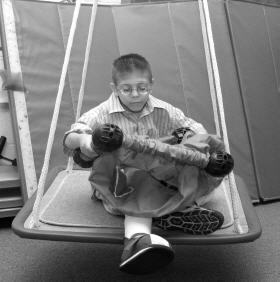 If your facility has a specific wheelchair swing (a platform on to which you can wheel the wheelchair and lock it in place so the child is able to swing while in his/her wheelchair), take the balloon meteors and try to hit them back and forth. 5. Involving children with severe physical/motoric limitations. Build a Toobeez rocket ship large enough to accommodate the wheelchair. Complete the countdown as stated in above activity. Either place the child in a wheelchair swing (seated in wheelchair) or complete a two-man transfer to a net swing or Cuddle Swing®. Use bubbles as meteors for an added sensory experience while in the swing! 6. For children who are nonverbal. If a student has communication goals that require them to use a switch (Big Mac, Step by Step, etc. ), record your voice saying “Blastoff!” on the device. After you countdown from ten to one, wait for the student to initiate the completion of the countdown by pressing the switch to say “Blastoff!” Continue with the remaining activity instructions.